Web Conceptions was hired to remake the company's website, including design, development, content research and writing, organic SEO and a kick-start in social media. At the same time, ADP Cyprus expanded on this to develop their marketing and branding in other areas. Crucial to this process, and as part of the overall service, Web Conceptions conducted in-depth market research to produce a communications strategy that planned the process prior to development, as well as post in the short-, mid- and long-term. Our team worked very closely and precisely with the client to bring the concept to life in short time. Meanwhile, the client's own creative and business skills, their ability to easily understand and execute various elements, tech savviness, as well as their motivation and extremely hard work, has been a huge boost, and will not doubt prove to me the main driver to their success; on- and offline. Also vital for this project was the planning and building a robust custom back office (CMS) for certain dynamic sections of the website, allowing for easy maintenance and continued expansion, namely for the project portfolio section and news. This new website is now sure to reaffirm and boost ADP Cyprus' exposure in the local Cyprus market, as well as further afield, whilst better promote their work in architecture and design. In turn, this should open new doors for the client and possibilities for providing their services, as well as new industry partnerships. 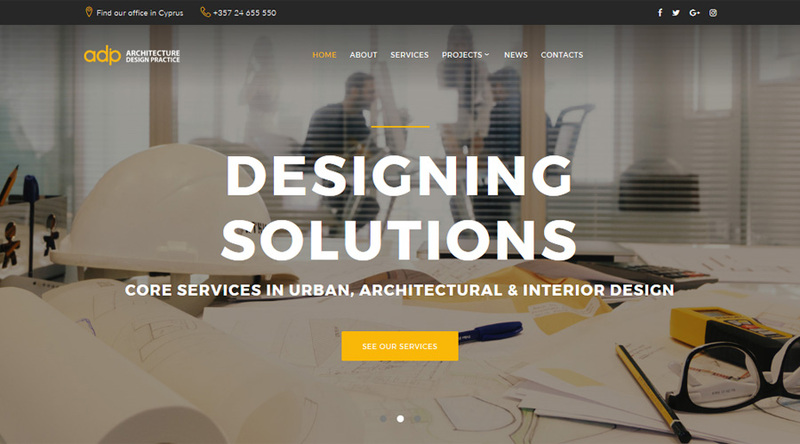 Backed by over 15 years' international experience and know-how in web design, development, IT, SEO and marketing communications, this new www.architecturedp.com website is a fantastic example of Web Conception's ability to thoroughly research and grasp a particular business sector and then deliver a unique and robust solution. It also further demonstrates our creativity, professionalism and proven working processes, able to easily and efficiently work with clients in various industries.